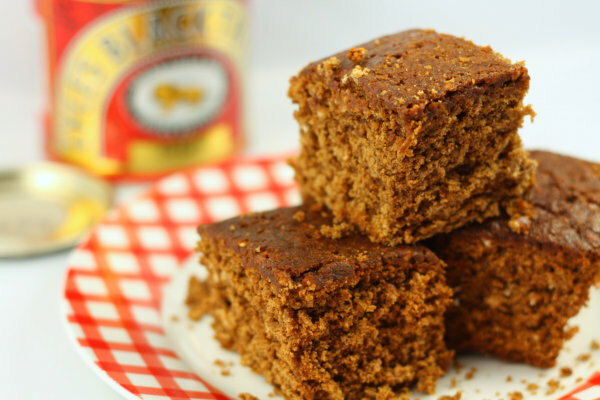 Make this authentic Yorkshire parkin a day or two ahead for a sticky teatime treat that cant be beaten. Wrap in greaseproof paper and put in an airtight tin for a few days to allow the flavours and stickiness to develop before cutting - this will give it a moist and sticky texture, as well as making the flavour richer and deeper. Preheat the oven to 180°C/Fan 160°C/350°F. Line two 15x20cm baking tins with greaseproof paper. In a pan, gently melt the butter (or margarine), golden syrup, black treacle and sugar until combined. Add the hot syrup mixture and stir to combine. Add the milk and beaten egg to loosen the mixture. Pour into the prepared tins and bake for 35-45 minutes, or until springy to the touch. Don't over cook it as it will be dry - if in doubt, take it out!